The heady mixture of typographic history, practice, and theory, which appears in these pages might taste a little medicinal at first. There are however, interesting connections between our authors’ articles. Jacky Wedgwood describes the restoration of a semi-derelict church in South London. Letraset, publisher of Baseline, has contributed to the cost of this work, which includes restoration of some painted inscriptional lettering designed by Edward Johnston and perhaps – or perhaps not – executed by his pupil, Eric Gill. Johnston seems to have designed the inscription whilst working on Writing, Illuminating and Lettering, the book which deeply influenced a generation of letterers and calligraphers two continents. As Jacky Wedgwood points out, this book and the surviving correspondence about his commission at Christchurch offer fascinating insights into Johnstons’ working methods: methods designed to satisfy the unique requirements – both aesthetic and utilitarian – of a particular text in a particular place. Type design is a different matter, and the methods, which produce good lettering may not always produce good typefaces. But Johnston and Gill, both primarily letterers rather than type designers, each designed alphabets which were to become ‘corporate typefaces’: Johnston for London Transport and Gill for the London & North-Eastern Railway (LNER). When LNER became part of British Rail, so did Gill Sans – until the 1960’s, when something more Teutonic began to signal arrivals and departures throughout Europe. Helvetica – and its look-alikes – now blandly proclaims authority, tradition and stability: a perfectly good typeface, but over-burdened with work for which it was never designed. 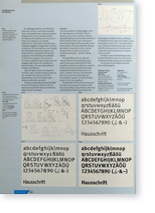 Matthew Carter and myself pick up themes explored in Baseline 6: we show how type designers solve some of today’s problems and illustrate the design of typeface for specific purposes. A corporate typeface for Europe’s biggest employer, Deutsche Bundespost, has much work to do: everything from large-scale signings to the complexities of forms and listings. The Bell Centennial family, designed for ‘maximum legibility and economy within rigid constraints’ is already flourishing in US telephone directories. Today’s type designers can draw upon resources more powerful than Johnston and Gill could have dreamt of to research, develop and evaluate their designs. But they might at the same time acknowledge that such resources help to sharply define their problems rather than to solve them. An experienced eye and a clear vision of aesthetics and utility are still needed for that. 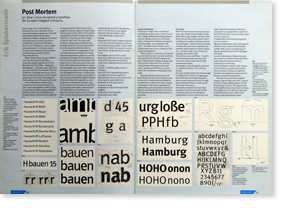 Three decades ago – say, around the time Helvetica was being designed – most people involved in typography had a fairly clear idea what a typeface was. Things aren’t so straightforward these days: computer-aided type-design systems, and imaging software and hardware have shaken up our settled notions. Over recent months in London, Munich, San José and Tokyo, gatherings of computer and type people have been discussing computer languages for text processing and protocols for the exchange of font information. This has involved, amongst other things, trying to define such notions as ‘type family’, ‘typeface’ and ‘font’. 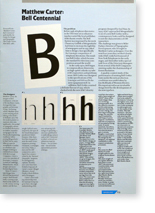 The argument may continue, so Robin Kinross’s question: ‘What is a typeface?’ is both timely and appealing. 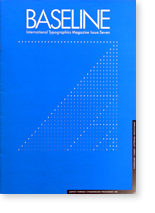 It may, as he says, have been first asked in a seminar room; but now it is being asked in other places, and not just by typographers and designers. Designing hand-made lettering and machine-generated typefaces: each activity supports the other. The touring exhibition organised by David Quay and sponsored by Letraset shows that creative lettering does not only make communication easier, wittier and deeper, but that it can sometimes become an art in its own right. 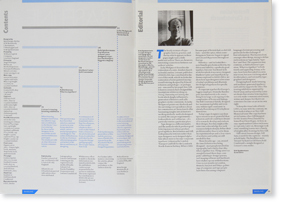 To keep the visual side of Baseline 7 in tune with the content, we have made it almost an ‘Eric Gill Memorial Issue’. The copy has been set in Joanna, a face Gill designed for the ‘Joanna Press’, founded by himself and René Hague. At first, in 1930, typefounders Caslon cut Joanna in 12pt only. Later on, Monotype took over, extending Joanna into a family of weights after drawings by Eric Gill. Gill’s most famous design, Gill Sans, is used for the captions – mainly as bold italic. 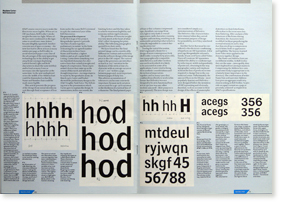 These headlines, were ‘Letraset’ by hand in Gill Extra Bold Condensed, a weight designed at Letraset’s own studio. 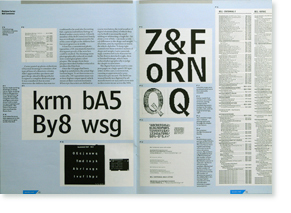 ©1986 Published by Esselte Letraset Ltd.